If I’ve learned anything during my graduate career, it’s how to count scale insects. On a rainy June day, I sat at a microscope with forceps trying to discern bark from insects that mimic bark. My targets were armored scale insects, which are essentially tiny bags of plant sap. The adult females have vestigial or no legs, and move around only in the beginning of their lives. The rest of the time, they lie under a cover built from their excrement and wax and eat plants. If they outbreak on a plant in your yard, you might think it looks sad and kind of grey. But you might never know who did it. Usually these excursions under the microscope are Zen, which is to say not very exciting. But on this day, I saw something rare, an event that happens every day everywhere but is almost never seen by people. I saw a tiny head peeking through a tiny hole in one of the scale insects’ covers. And when I poked the cover, it started chewing its way around the hole. Here’s a video I took of it in action. This was a parasitoid wasp, specifically Coccophagus lycimnia, which is a jack-of-all-trades, yet master plant protector. 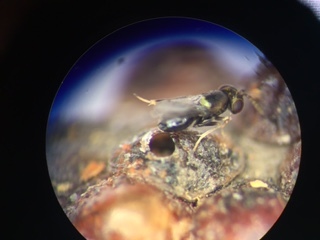 I found it attacking gloomy scale, a maple pest, but Coccophagus lycimnia attacks all kinds of scale insects, including armored scales, soft scales, and mealybugs, in forests, cities, and orchards, which is to say, pretty much everywhere on a slew of plant species (see Universal Chalcidoidea Database). It is an especially effective parasitoid of soft scales, in that it attacks immatures and prevents oviposition, while many other parasitoid species reduce egg production in soft scales but do not prevent it. Parasitoids protecting street trees are diverse. We’ve documented upwards of 10 species that attack one scale insect species. While people run into certain parasitoids often—you’ve probably seen tomato hornworms covered in braconid cocoons—those that attack street tree pests are difficult to observe because they are smaller and live up in trees. They look like gnats to the naked eye, but under a microscope their metallic armor is striking and makes me wonder what else in the world I’m missing because I haven’t looked hard enough. Parasitoids are natural, free pest control along with other natural enemies like lady beetles. 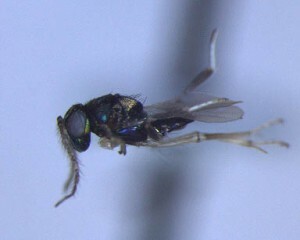 Insecticide applications can kill them, including Coccophagus sp. (Suma et al. 2009). Horticultural oils are effective against many scale insect species and can serve as a non-toxic alternative for natural enemies. Suma P, Zappala L, Mazzeo G, Siscaro G (2009) Lethal and sub-lethal effects of insecticides on natural enemies of citrus scale pests. Biocontrol, 54, 651-661. Rakimov A, Hoffmann AA, Malipatil MB (2015) Natural enemies of soft scale insects (Hemiptera: Coccoidea: Coccidae) in Australian vineyards. Australian Journal of Grape and Wine Research, 21, 302-310. 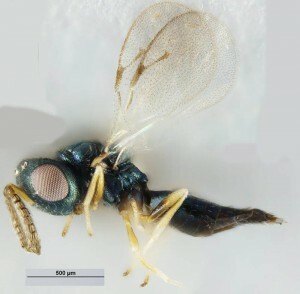 Tena A, Soto A, Garcia-Mari F (2008) Parasitoid complex of black scale Saissetia oleae on citrus and olives: parasitoid species composition and seasonal trend. Biocontrol, 53, 473-487. 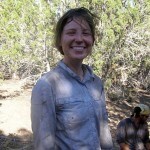 Emily earned her PhD in the Frank Lab in 2016. She’s interested in how human pressures (like urbanization) change the insects that live around us. Find her at emilykmeineke.com.